Buddhists believe that at death, a person goes through a process called samsara, or reincarnation, and can be reborn as a god, demigod, human, animal, hungry ghost or hell creature, depending on his thoughts and actions during life. While Buddhism doesn't require specific practices at death, the rituals that do take place focus on helping the individual achieve a better station in the next life. In Buddhism, burial and cremation are both practiced. Buddhists believe that death is a natural part of life and that its final moments can significantly impact the individual's rebirth. When death is imminent, Buddhists focus on caring for the individual's mental and spiritual state, rather than unnaturally prolonging his life, to encourage a good rebirth. To that end, Buddhist end of life rituals center around keeping the person calm, peaceful, and focused on the good deeds performed during his life. Relatives will place images of Buddha and flowers around the room to keep the person calm in the face of death. Not only does this create a calm, peaceful environment, but helps maintain the focus on religious thoughts and the good deeds performed during life. A mandala blanket, used during meditation, may also be used as a visual to help keep the person focused on good deeds and religious thoughts. The family or friends may ask a monk to come and chant verses or read prayers, which helps the individual remain calm and peaceful in the face of his impending death. The monk can also encourage the dying person to focus on the good deeds performed during his life. It is not uncommon for the dying or his family to bestow gifts to the monastic community to curry good favor. Family and friends may perform good deeds in the dying person's name (if possible, the person should acknowledge the actions). These good deeds are transferred to the dying person, in the hope of achieving more merit at death for a better rebirth. There may be a wake in which mourners pay their respects to the deceased and their condolences to the family. It may be an open casket funeral before cremation or a memorial service after burial/cremation. There will most likely be a portrait of the deceased which is the centerpiece of the altar in front of the casket. An image of Buddha will be near the altar according to Buddhist tradition. The altar will have candles and incense burning. Offerings of fruit and white or yellow flowers are acceptable. No red flowers since red symbolizes happiness. Donations made to the family is acceptable but gifts of food are considered inappropriate. 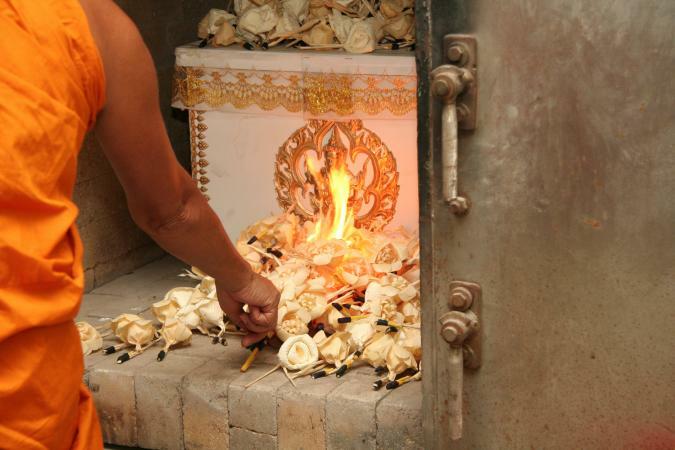 Buddhists tend to prefer cremation and believe that it releases the soul from the physical form. Buddhists may follow the tradition of cremation on a funeral pyre which is the burning of a pile of wood that the corpse has been placed on. There are no rules or specific timeframe that determines when the burial or cremation should take place. The funeral rites are conducted on the morning of the burial/cremation ceremony. Monks or family members may conduct the funeral rites according to Buddhist traditions and the family's wishes. Buddhism allows organ donation and autopsies. It is preferred to be done 3-4 days after death which is believed to be when the soul has left the body. When arriving at the funeral or wake, you quietly proceed to the altar. Mourners should pay their respects with a slight bow and hands folded in prayer. May pause at the casket for a quiet moment of reflection. Mourners may walk with sticks to signify support needed from their grief. Mourners find a seat and wait for the service to begin. If monks are leading the service, follow their cue as when to sit and stand. There will be sermons, prayers, chanting and eulogies. You may chant or sing the appropriate sutras (prayers). If unable to chant, you may sit quietly. There may be group meditation. There may be gongs or bells rung. The service will last approximately 1 hour. Mourners should not record the service. The family typically wears white or a white cloth over their clothing. This is worn in the Buddhist tradition to symbolize grieving and is a sign of respect for the deceased. The family may wear a headband or armband as well. Bright colors or displays of wealth in clothing choices are not appropriate. No red attire specifically as it is also deemed inappropriate since it symbolizes happiness. The color of the clothing worn at a Buddhist funeral is more important than the attire itself. While the clothing should be simple and respectful, it should not be too informal such as black jeans and black t-shirts. Like those performed pre-death, post-death rituals and Buddhism burial practices are intended to aid in attaining a desirable rebirth and give merit to the deceased. Some rituals are general to Buddhism, while others are practiced only by certain cultures. Chenrezig Mantra (Avalokiteshvra Mantra) : "Om Mani Padme Hum." This means praise to the jewel in the lotus. The Heart Sutra Mantra: "Gate Gate Paragate Parasamgate Bodhi Svaha." This means the heart of the perfection of wisdom. Medicine Buddha Mantra: "Tayata Om Bekandze Maha Bekandze Radza Samundgate Soha." This means may the many sentient beings who are sick, quickly be freed from sickness, and may all the sicknesses of beings never arise again. Theravada Buddhists (those from Sri Lanka, Myanmar, Thailand, Laos and Cambodia) can incur good favor for the deceased by offering the monks white cloth to be used in the creation of robes. The merit generated by this deed is transferred to the deceased by pouring water into an overflowing cup while performing chants. 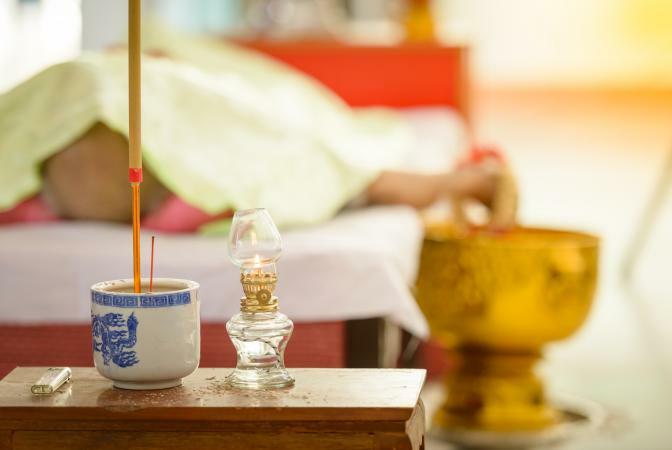 Buddhists in Thailand and other Southeast Asian countries practice these rituals. Bathing Ceremony - The deceased's family and friends pour water over one of the deceased's hands before placing the body in a coffin that is surrounded by wreaths, candles and incense. A photo of the deceased is often placed alongside the coffin, and colored lights hung above. If the body is to be cremated, the cremation is often postponed for a week so distant relatives have a chance to show honor to the deceased. In these instances, monks come daily to chant over the body. Offering of Food - Before the body is buried or cremated, relatives offer food to the monks who visit the home in the name of the deceased. Like other offerings, this helps bring merit to the deceased to help in his rebirth. In addition to the offering of cloth to the deceased practiced by Theravada Buddhists, Sri Lankan Buddhists have several other death rituals to aid the deceased in his rebirth. Preaching - A week following the funeral, Buddhist monks in Sri Lanka return to the deceased's home and preach an hourlong sermon with relatives and neighbors. Family, friends and neighbors enjoy a meal together afterward. Offering - Sri Lankan Buddhists make offerings in the name of the deceased three months after the funeral, and every year after that. The purpose is to continue to gain good merit that can be transferred to the deceased to aide in his rebirth. Tibetan Buddhist death rituals follow the tradition of earning merit for the deceased but were also born out of practicality. Sky Burial - A sky burial is the practice of leaving the body to be eaten by vultures or other animals. It is another way for the deceased to earn merit posthumously, as it is considered a final act of generosity to the animals. The sky burial also developed for practical reasons. The scarcity of firewood in Tibet made burning the corpse difficult, and the ground is not always suitable for burial. Reading of Texts - During the Bardo, the 49 days between death and when rebirth is thought to occur, relatives read texts specific to any practices the deceased focused on. The readings help the deceased in his journey to rebirth. Chinese and Laotian Buddhists celebrate Ghost Month, a time when the gates of hell are opened, and hungry ghosts are thought to walk the earth in search of food and gifts. 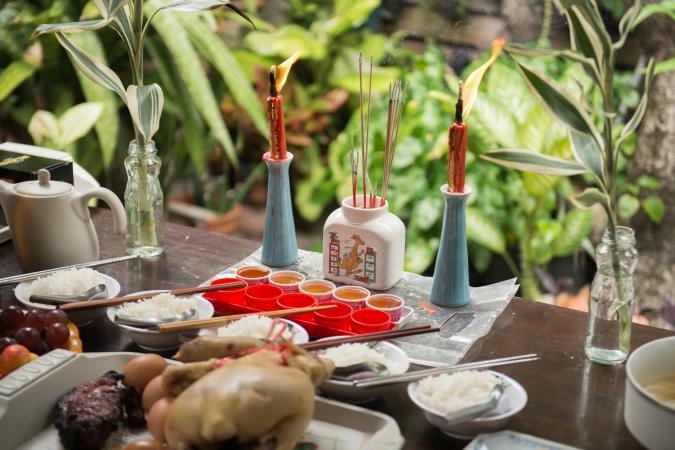 During this time, friends and relatives offer food, incense, paper money and other gifts to the deceased spirits to garner good merit for their loved ones. Paper lanterns in the shape of lotus flowers are also placed in lakes and rivers to guide the way for the spirits. The ultimate goal of Buddhism is for every individual to become free of samsara and achieve enlightenment, or nirvana. This state can take many lifetimes to achieve. Until then, Buddhist death rituals help those practicing the faith attain a good rebirth to aid them on their journey.